Enough partying already Zen, time to come home! Will keep sharing and praying. 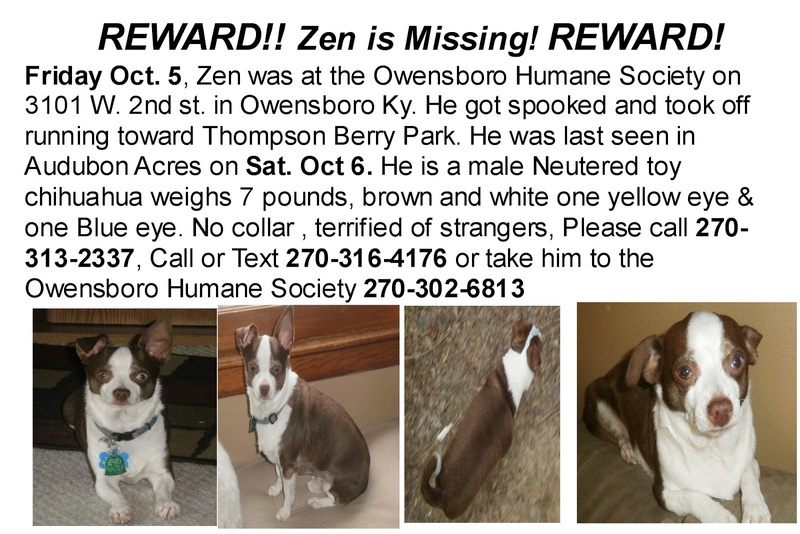 We're praying Zen is home safe soon! We'll share. Thank you for praying and sharing. We appreciate it. Praying for Zen safe return. I hope he makes it back to you soon. Thank you! Prayers are always appreciated. One of my BigBro's dogs is a chi mix that they found roaming their neighborhood. Had been on the Road while--skinny. Now a month later he is happy, sweet, and loves his two brofurs. He bolted ONE time from their front door; now they know how he got lost. 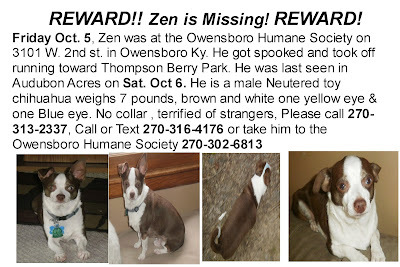 No ads, no flyers, no one working hard to find him, like you are with Zen. He may be in someone's care until they find YOU! I hope so because the thought of him out in these cold nights is more than my heart can take. We have him on the social networks, radio, Tv stations, fliers have been put up in all the neighborhood, area businesses, vets offices, shelters have been alerted and in the newspaper. I hope someone returns him.